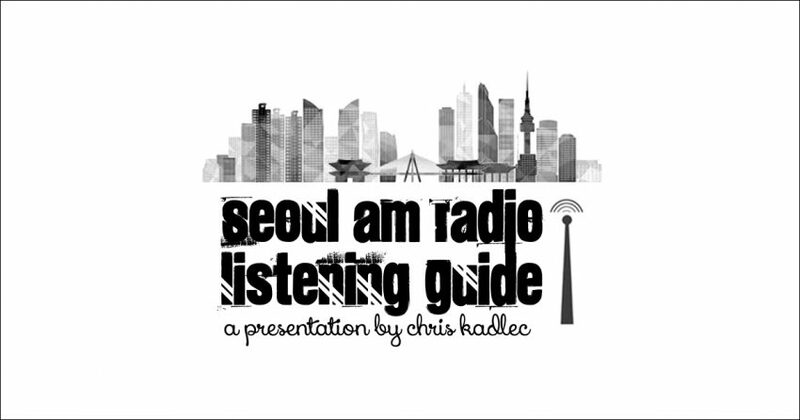 The Seoul AM Radio Listening Guide is a three-hour documentary broadcast narrated by Chris Kadlec that looks at the AM band as heard in Seoul, Korea after dark. 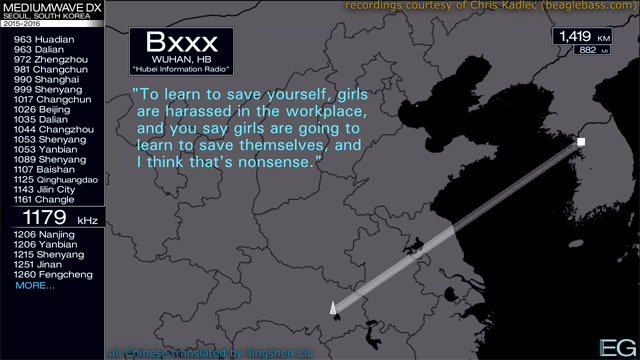 In addition, it takes a look at propaganda and signal jamming as part of the radio wars between Seoul and Pyongyang. The broadcast is accompanied by a detailed 115-page guide and complete audio transcript (pg. 91-115), which is also previewed below. 〈서울 AM 라디오 수신 가이드〉는 세 시간짜리 다큐멘터리로 115 페이지에 달하는 안내서와 Chris Kadlec의 내레이션으로 구성되어 있으며 한밤중에 서울에서 수신되는 중파 대역에 대해 자세히 다루고 있습니다. 또한 선전(대남·대북) 방송과 방해 전파를 남북간의 라디오 전파 전쟁과 관련지어 수신 가이드의 일환으로 다루고 있습니다. 이 방송에 모든 내용들은 즐거움과 교육적인 목적만을 위한 것이라는점을 반드시 유념해두세요. 대한민국과 북한으로 부터 온 어떠한 선전물들은 어느 한쪽을 편애하며 퍼뜨리는 수단이 아닌 순수한 교육적인 것임을 알려드립니다. For station details and the audio transcript, download the station guide. Is your English not so great? Try the commentary-free version (2:02:29) here. 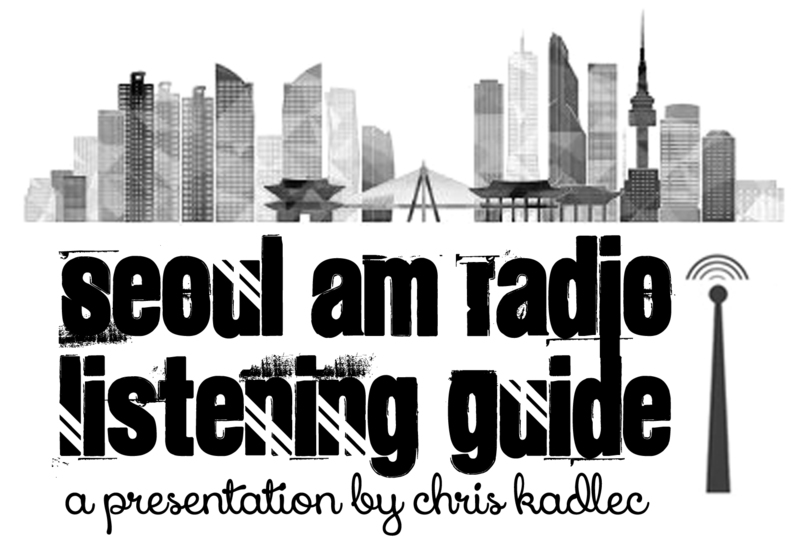 Welcome to the Seoul AM Radio Listening Guide! 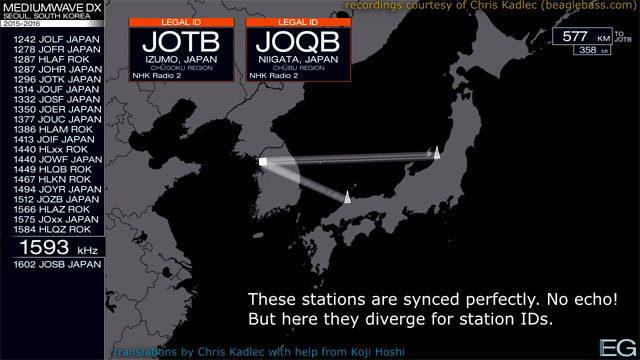 I'm Chris Kadlec and today we'll take a very detailed look at the Seoul medium-wave band and radio throughout East Asia one frequency at a time, including more than 160 skywave regulars. You'll hear Cold War-era signal jammers and propaganda, music from Taylor Swift, Beck, and Foreigner to Michael Bolton, Black Sabbath and Bach, some Chinese opera, top-of-hour station IDs, and a general look at major regional radio networks and their content and programming. As a final bonus, we'll run through 30 Korean AM jammers frequency by frequency, take an extensive look at Korean propaganda stations on both FM and shortwave, and listen to a late-night national intelligence numbers station broadcast to North Korea. 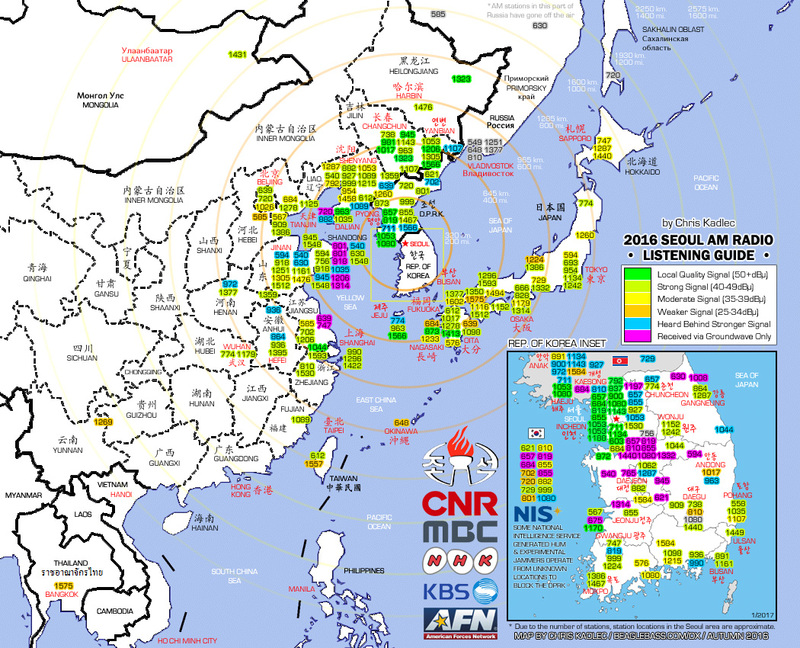 Stations included in the Seoul AM Radio Listening Guide, as regularly heard in Seoul. A year after the first consideration, Ryan Grabow finally collaborated with me to add three video bandscans to his YouTube series using the audio and translations I provided to him. He did a great job and has helped spread my project to numerous video-saavy listeners who wouldn't have found it otherwise. Enjoy 51 minutes of audio paired with maps, additional station information, and subtitles to better understand and appreciate what is the AM band in this region. Realizing that the full 3-hour documentary isn't for everyone (perhaps try my 6-hour FM documentary instead? ), there's also a quick summary of the Seoul AM band in just 10 minutes. Download the station guide for this specific broadcast here. For the hit-and-run listener, the Seoul AM radio band at breakneck speed. All clips featured are from the full 3-hour documentary. The following file is embedded. Use controls at the bottom to navigate through the pages. Keep in mind that links do not work in this version. For full functionality, it is recommended that you instead download the guide. I'd like to take a short time to introduce the different jammers used on the Korean peninsula and a bit of background on these as it tends to be misunderstood that only North Korea has an interest in jamming, which is very much not the case. The reason for the jammers is more of a government propaganda war and as neither AM nor shortwave are especially popular among South Koreans, the majority of the general public has little idea as to what is going on right under their noses, nor do most people think of or care about any threat from North Korea. The fact is, Korea is the most technologically advanced nation on Earth, 4G and WiFi nearly everywhere, DMB (the mobile phone TV channels) repeated all throughout the nation. All this leaves little use for most people when it comes to AM radio. 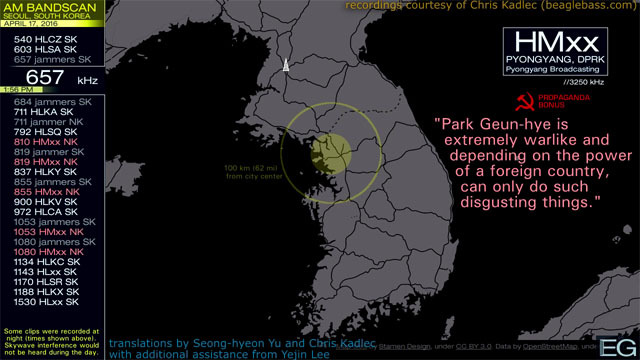 The average Korean, keeping in mind that Seoul's suburbs are no more than 10 miles from the border, really doesn't think much of the perceived conflict. However, it's very obvious to one upon tuning in on the radio, especially on AM and shortwave. The majority of the jammers on the air are run by the south as a way to block the high-powered signals from the north, though many of those signals in the north actually exist for domestic use and don't target the south at all. The south believes that it's protecting its citizens from content they're better without, which it also does by extensively censoring the Internet, including all North Korean content and anything that goes against the expected social and moral norms the now-highly unpopular government wants to push on the people. Now this isn't to say the government is in the wrong on the jamming situation. The two sides are fighting a propaganda war against each other and jamming is perhaps in the best interest of both sides. After all, it makes for interesting listening, right? In fact, I'm not even saying that either the south or the north is correct in their views, merely documenting the situation from an impartial perspective. One day these stations - these jammers - will be gone. I'm just here hoping to capture them in the moment. Korean Central Television (조선중앙텔레비죤 개성 송신소): TV network with low-FM band audio. While the north's main TV broadcaster, Korean Central TV, is well-jammed in the south by local communication networks purposely using the frequencies of the north's video carriers, not to mention the north using analogue as the south has converted to digital, its audio carriers are another story. Because the north uses the Russian and Japanese FM band for its television audio and most people in Korea don't have a radio that tunes that low, the TV audio carriers are wide open for a listen. The station is aimed away from the south and is meant for a domestic audience. You can hear both the innocent and the sinister here, no language skills necessary for these. The following was recorded locally on Korean Central Television's Kaesong affiliate. As its audio frequency is not widely-known as many of the local AM and FM stations are, it is not being disclosed here. 대한민국과 북한으로 부터 온 어떠한 선전물들은 어느 한쪽을 편애하며 퍼뜨리는 수단이 아닌 순수한 교육적인 것임을 알려드립니다! Echo of Unification (통일의 메아리 방송 해주 송신소): FM radio and shortwave network / former AM radio network. Along with 1053, 1080 is the second of the two Haeju locals, of which the sign-on sequence can be heard here. This one is Echo of Unification which has been broadcasted locally on 97.8 (former Pyongyang FM) as well since 2013, a signal that just screams across the water despite the jammer in Seoul. The station, just like 1053 and broadcasting from just up the road from the FM, is 1500kw aimed at Seoul but runs propaganda broadcasts for two hours at a time, three times a day - morning, afternoon, and night. In the afternoon, 1053 turns off and 1080 turns on immediately after. Oddly enough, 1080, which is flat-out anti-South propaganda, is less jammed than 1053, which is basic domestic North Korean programming. There's a beehive jammer at the main NIS tower site in Seoul and not much else, though the Hwaseong experimental site came on with a new jammer in November of 2016 that fills in the suburbs exceedingly well much to the common hobbyist's demise. However, a month later, both 1053 and 1080 permanently went off the air in favour of new FM transmitters. Korean Central Broadcasting (조선중앙방송 평양 송신소): AM radio and shortwave network. 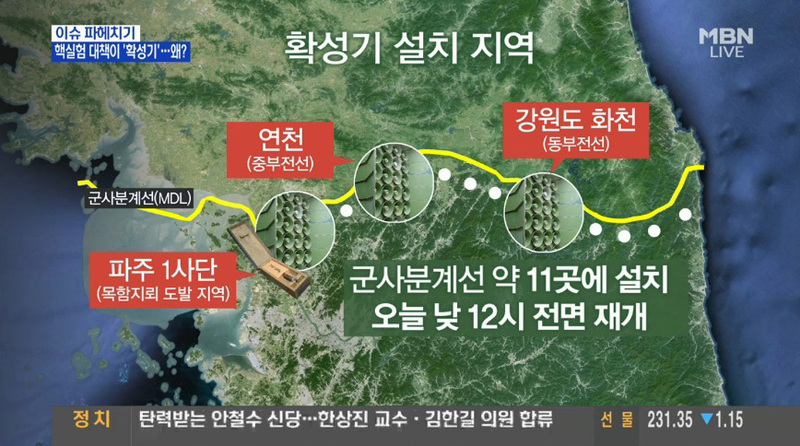 819 is rather heavily jammed in Seoul as it's the flagship frequency of the KCBS network, the Korean Central Broadcasting Station or in Korean, Joseon Jungang Bangsong, to the north in Pyongyang. This one has a variety of programming that includes propaganda, radio stories, news, music, and cultural programming and its programs and signals run part-time on the rural Pyongyang Bangsong signals. While it's well-blocked in the city - the jammer is just 6 miles from my radio here - it's easier to pull it in along the coast. And as a sidenote, the station runs a video game-sounding jammer during its late-night off-air hours that counters the Seoul beehive jammer. Listening to the two of them duke it out can be ultimately hilarious. Pyongyang FM (평양FM방송 해주/개성 송신소): FM radio network. Pyongyang FM - a domestic FM network - was a constant powerhouse outside Seoul from both neighbouring Kaesong on 92.5 and from Haeju on both 97.8 and 103.7. Echo of Unification (a propaganda signal aimed at the south and featured above) eventually took over 97.8 in 2015. As part of the north's radio restructuring plan in December 2016, Pyongyang FM migrated its programming elsewhere (while still on satellite, it is unconfirmed if it still exists anywhere on-air, perhaps only in Pyongyang) and former Pyongyang FM signals switched to Pyongyang Broadcasting (평양방송), parallel to 657's AM signal while the monster 1053 (Pyongyang Broadcasting) and 1080 (Echo of Unification) signals in Haeju were turned off at that time. Meanwhile, to compensate for the AM band loss, the north added new FM signals just outside the Seoul suburbs. In its day, Pyongyang FM, despite its terrible overmodulation (i.e. distortion) on the Haeju transmitter due to broadcasting on an extremely wide signal heard from 97.3 to 98.5, was full of memories for me, from listening to the New Year's broadcasts to the live funeral of Kim Jong-il in 2012. So why are many of the Pyongyang FM clips so distorted? The answer lies half with their transmitter and half with the receiving radio. Simplifying the explanation that I myself didn't grasp at the time, Pyongyang FM's Haeju transmitter broadcasts their 97.8 signal very wide so that it can be heard in the south from 97.3 to 98.5 on many days. That's not especially normal. However, a sensitive tuner limits the space each frequency occupies so that the listener doesn't face interference from adjacent frequencies. With the band in neighbouring China using 10MHz spacing (i.e. 96.0, 96.1, 96.2, etc. ), you certainly want a sensitive radio. (You can see my logs from China here, where some other signals face a similar issue). When the louder sounds reach a certain level, instead of evenly spreading out on the frequency, the radio limits it to solely 97.8 and the remaining sound is clipped, causing the sound to bounce back, as can be heard during the opening tones of the network's sign-on and also causing the distortion in the voices. At the same time, softer music doesn't reach that threshold of sound and therefore sounds normal. AM radio monitoring locations with full daytime bandscans included for each in the guide. While Pyongyang FM is just a few miles across the border from the south, the opposite side of the border is lined with propaganda stations aiming north. Unlike the military might that the north often throws around in their propaganda, the south prefers the rainbow-throwing approach. Phrases like "haengbok Korea," or "happy Korea" are extremely common on these stations, touting the south as the promised land where people are happy. There are two FM networks with a handful of individual stations in the vicinity of the border which run a variety of programming. We'll take a brief look at both networks here, both of which have been on the air for many years, followed by two of the main shortwave propaganda broadcasters in the Seoul area and the differences between the two bands. Jayu FM (자유FM 파주 송신소): FM radio network. The first on FM is Jayu FM, or in English, Freedom FM. 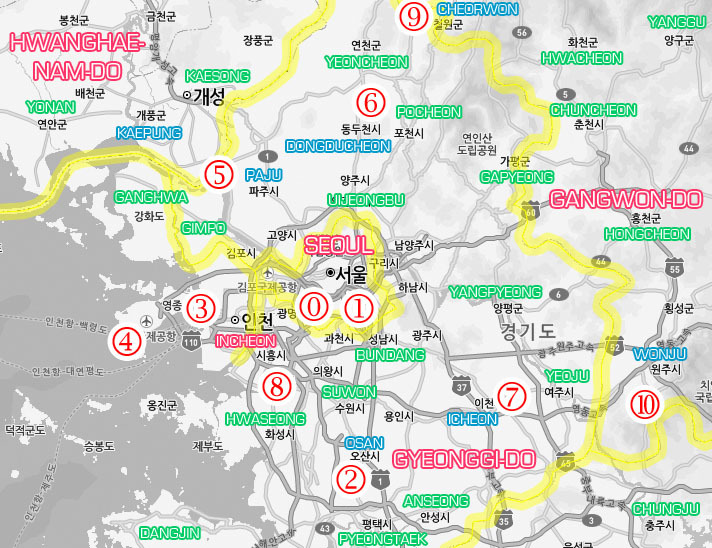 This is a network consisting of numerous FMs along the border, including the 97.7 in Paju (파주), 94.5 in Yeoncheon (연천), and 100.6 in Inje (인제). Jayu FM has been around for many years with a similar sound as today. Nowadays, Jayu FM begins every broadcast with the popular song "Seoul, Seoul, Seoul," prior to sign-on, a sort of love song that glamorizes Seoul that was released in time for the 1988 Seoul Olympics. Here's the full sign-on sequence of Jayu FM (heard only as a brief clip in the full documentary) followed by the station's daily 3pm sign-on some five minutes later. Voice of Freedom (자유의 소리 방송 화악산 송신소): AM and shortwave radio network. The Jayuui Sori network, the Voice of Freedom, is similar to Jayu FM with some slight differences. It broadcasts on 101.7 in the islands, 103.1 in Incheon, and 107.3 in the central region, the latter of the three best received in Seoul, broadcasting for about 20 hours a day with hour-long breaks throughout the day. While the network pre-dates them, Jayuui Sori has broadcasted the content of the loud-speakers aimed north along the border since 2015 for much of the day and includes pop music, news, and more. The station has changed very little in past years and uses the exact same sign-on sequence as it did five years prior. Radio Free Korea (자유코리아방송 서울 송신소): AM radio network. RFK signed onto 1143 back in 2014, and is, like its FM counterparts, an anti-North Korean propaganda station. It signs on whenever it darn well feels like it, regardless of its officially mentioned hours in their ID, usually between 6 and 9 at night, and turns off every morning at 6. The signal is overwhelmingly weak in the south, even with a poor signal at night just 30 miles south of Seoul, leading to believe most of its power is likely aimed northward. In fact, Jilin City Story Radio can be heard in RFK's off-air hours and can always be heard under RFK along with the North Korean jammer when RFK is on the air. Echo of Hope (희망의 메아리 방송 서울 송신소): Shortwave network. The heavily jammed shortwave broadcasts air a variety of programming, mostly talk interlaced with some pop songs. These broadcasts are clearly aimed at a North Korean audience as opposed to many of the South-based stations that also aim content at South Korean citizens. As a matter of fact, it can sometimes be difficult to tell these shortwave broadcasts apart from content from the north. Here's Echo of Hope. 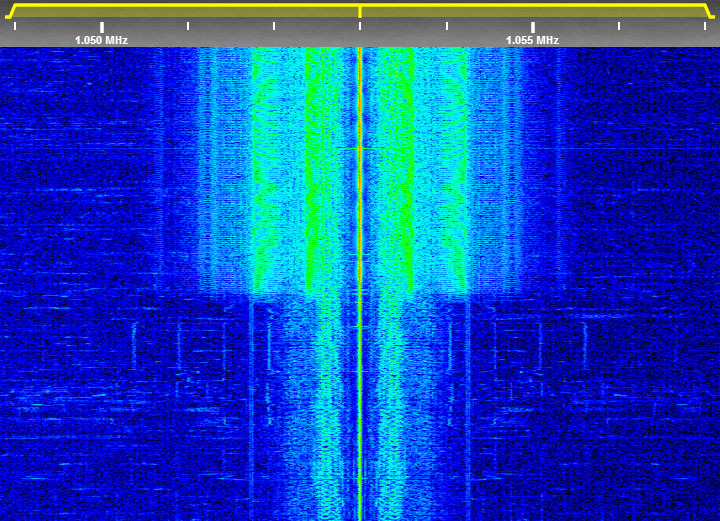 Most of the jammers you hear in the background are actually South Korean, bleeding over from AM frequencies that share the shortwave tower sites. Voice of the People (인민의 소리 고양 송신소): Shortwave network. This network is similar to the other shortwave propaganda signals originating with South Korean intelligence. A lot of talk, sometimes a break for a pop song, and some other programming peppered between. All in all, for a non-Korean, it's some pretty dull content. Furthermore, the shortwave signals are impeded by the north's main shortwave jammer site based 15 miles (25 km.) outside Kujang (구장읍). 3480 Voice of the People propaganda aimed at the north, heard clearly without jamming from beside the tower site. Like many of the propaganda networks, both north and south use entertainment programs and music to spread their message - though the musical selections chosen to propagate the messages varies from nationalist in the north to pop in the south. V24 Numbers Station: Shortwave broadcasts. This is a South Korean intelligence broadcast for Agent 3890, a numbers station broadcasting a coded message to a specific agent in North Korea. All numbers stations identify each agent by a specific K-pop song followed by their agent number and the text-to-speech coded message using Korean numbers, different from North Korea's V15 broadcast that uses page numbers in addition. 3890, 3890 전문 받으세요. 조수 13조 본문 부르겠습니다. 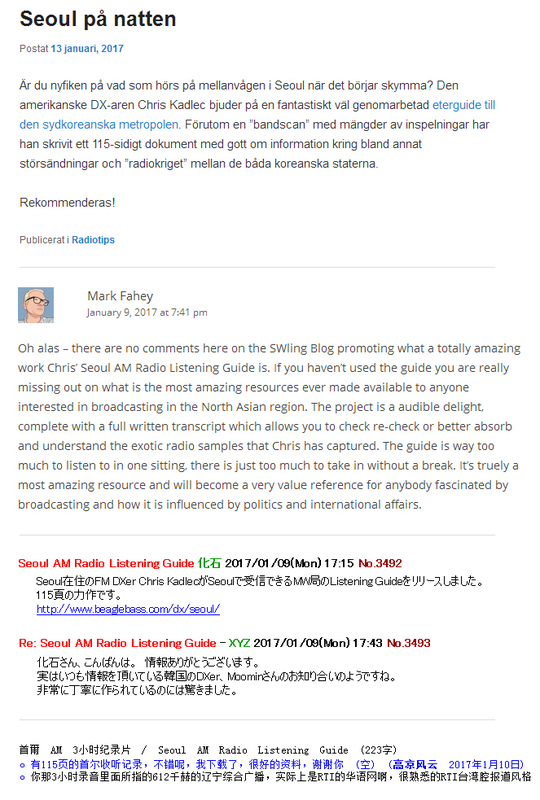 After it was released in 2017, this project got positive reviews from the radio community around the world, including reviews in Chinese, Korean, Swedish, Bulgarian, Japanese, and others. It was featured in Shortwave Bulletin, on numerous radio sites, and on Glenn Hauser's World of Radio (#1860) broadcast. If you enjoy this documentary, please share it with others who may enjoy it. Due to YouTube's strict copyright guidelines and the (copyrighted) musical nature of radio, the fact that the project as a whole isn't on such sites hampers its visibility. Disclaimer: Due to my long-term residence in Korea, I have chosen to voluntarily omit selected details, such as photos, videos, and other related information from this page and guide.